Xbox owners patiently waiting to enjoy the new Conan Exiles which will be available via the Xbox Game preview from tomorrow August 16th 2017 and the release will include the brand new free huge expansion, The Frozen North. Check out the 60 minute gameplay trailer below to learn more about what you can expect from the game on the Xbox One console. Frozen North is the second stage of the Conan Exiles Early Access adventure, introducing an entirely new environment to explore, new features and many more enhancements to enjoy. 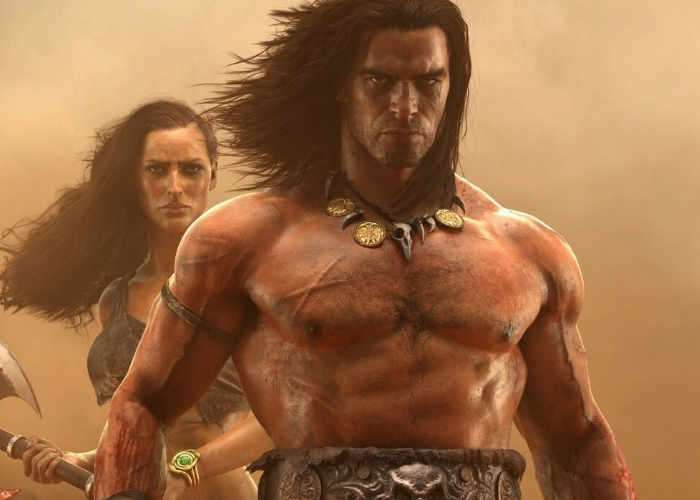 • A HUGE, NEW LAND: The world of Conan Exiles is now 70% bigger! Climb towering mountains, explore deep forests, fight your way through massive new dungeons, and discover new people, cultures, and settlements. • WEATHER AND TEMPERATURE: In the north, rain and snow can make you freeze to death and in the desert, the burning sun can be equally deadly. Make sure you dress for the weather to stay cool or warm. Camp fires, torches, drinks, and more can also help you control your temperature. • NEW BUILDINGS AND RESOURCES: Harvest new resources such as star metal, black ice, and more. Build new homes and entire cities with all new building pieces and furniture, and make sure to use the right materials to either keep your home warm or cool. • NEW RELIGION AND AVATAR: Dedicate your work and worship to Ymir, the Lord of Storm and War. Summon his avatar and use his giant battle-axe to crush your enemies! • NEW ENEMIES: Encounter towering Frost Giants, hungry wolves, aggressive mammoths, and many other new enemies. You must also go head to head against new dungeon bosses such as Tyros the Deathbringer. • BREWING AND COOKING: These two new crafting systems lets you brew different drinks and cook up a variety of juicy meals. Make mead, wine, absinth, bug soup, demon blood sausage, and more. You can even trap fish and practice beekeeping! • BETTER THAN EVER: The expansion update brings with it a host of improvements such as better combat, better artificial intelligence on human enemies, and more. This is in addition to the 28 updates worth of additions rolled out over the past six months including climbing, siege equipment, avatar defenses, dying system, and much more! • NEW ARMOR AND WEAPONS: Find and craft three new material types: Star Metal, Black Ice, and Hardened Steel. Equip many new kinds of equipment, including the Vanir Fur Armor that will protect you from both cold temperatures and enemy strikes!